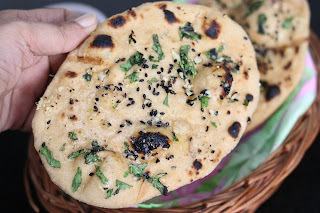 See how to make Garlic naan without oven, tandoor and even without yeast. These are perfect whole wheat naan made on tawa, Garlic butter is simple to make at home. 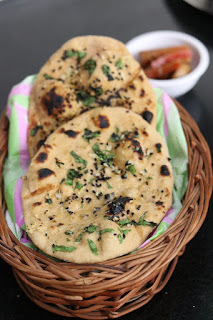 Do try making these soft and yummy naan. 1. Make a soft dough using all flour, salt, sugar, baking powder, baking soda. Add curd and milk in batches and add only the required quantity of milk sufficient to kneed a soft dough. 2. Cover the dough with wet cloth and keep side for resting for 2 hours till it doubles up in volume. 3. When the dough ferments well, knead for 2-3 more times and make small balls to make naan. Roll the naan in oblong shape. Spread a coating of butter, sprinkle garlic, coriander and sesame seeds. Press it gently. 4. Flip the naan and apply water on the back side of the naan. Place the naan on heated gridle/ tawa. Flame should be medium to high while cooking. Naan will start to puff up. Allow it to cook for 2-3 min and then flip the tawa onto the gas flame directly. Keep a little distance from flame, in case the naan tends to burn. And cook the front side of naan. 5. Remove the naan from the tawa and apply little butter before serving. 6. Serve garlic naan with pickle or dal makhani and enjoy freshly prepared garlic naan made on tawa.